Not everyone can afford their own dryer. Or they just do not live in a space large enough to accommodate an electric dryer. To overcome this problem, you may want to consider one of the top 10 best folding clothes drying racks in 2019. These clothes drying alternatives fold up nice and small to fit in small places. They also do not take up a lot of space when they are drying your clothes. These folding clothes drying racks are a great option when your space is limited. Even though it is made from steel, this drying rack is still not that heavy. The steel construction ensures that it will last you for years but remain easy to move from room to room. When not in use, it folds up nice and small for easy storage. Its overall measurement is 14.5 x 29.5 x 41.75 inches approx., which makes it large enough to hold up to 32 pounds of wet clothes. Along with the top rack, you get 7 extra bars to hang your laundry on to dry. Given a white epoxy coating, this rack is waterproof and will resist stain and mildew. If you are lacking for drying space, this folding rack should fit in your bathtub with ease. This self-standing folding clothes drying rack uses three legs to remain stable while holding up your clothes. Its two adjustable fold-out arms lock into place reaching between 49 to 75 inches in length. Then the main pole can adjust between 37 to 70 inches high. This gives you plenty of drying options when you do not have the space to dry your clothes. Made from durable stainless-steel pipe this rack will hold up to 110 pounds. Assembly is easy, and no tools are required. The ABS plastic holders are also strong enough to keep this drying rack together for years to come. Plus, it is a handy tool to take with you if you travel. It is portable and does not weigh that much. 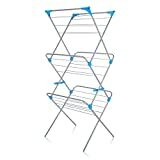 It may not look that strong or sturdy, but this drying rack is made from tube steel. It is so strong that it can hold up to 2 wash loads at the same time. With all the bars attached, you also get up to 49 feet of drying space. The rack is easy to assemble and comes with four corners where you can attach hangers. The auto-locking feature makes sure every level is secure and tightly in place. Your apartment should not be so small that it cannot house a rack that measures 55.5 x 23 x 21.6 in. in size. If you are not sure how much 2 wash loads weigh, just make sure you do not place more than 44 pounds of wet clothes on the bars. What do you do when you do not have enough floor space for standing clothes drying rack? You get a drying rack that attaches to your wall. The 5 powder coated steel bars provide up to 14 feet of drying space. The bars will hold up to 27 pounds of laundry when pulled out from the wall. Then when not in use, you can fold it back up. It will take only about 2 inches of space when folded. The folded drying rack won’t clash with your room’s décor. It will look like a simple towel rack. If push comes to shove, you can attach this drying rack to a covered outside wall. It is made for indoor and outdoor use. When you pull this folding clothes drying rack out from the wall, you get 22 ½ linear feet of hanging space. Plus, the rack will hold up to 60 pounds of laundry. Its stainless-steel construction provides the strength you need in a drying rack. If you do not need to use it anymore, just fold it back up against the wall. It does not really detract from your room’s décor. Clothespins will work on these steel rods in case you want to attach this folding rack outside. Unfolded the rack measures 34.65 x 23.6 x 8.86 inches in size and folds up to just over 5 inches deep. 8 steel rods come with this unit providing you with more than enough drying space. 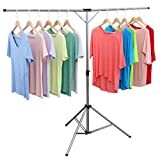 Measuring 64.5 x 26 x 26″, this self-standing clothes drying rack is easy to move and easy to assemble. Folding it up and unfolding is not that difficult either. The arms may be short, but they have hanger holes. These holes let you hang your laundry easier. Each plastic arm can hold roughly 6 pounds of clothes and you have to watch how you hang your laundry. Overloading one arm may cause the rack to tip over. Its 3 legs have a wider stance to provide the stability to the drying rack. Additional support to both the arms and the legs keep this drying rack functional and safe to use. 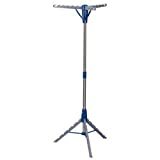 It is lightweight enough to travel with you if you need a garment rack away from home. Nothing beats the look of wood. It just goes with everything in your house and even makes your wet laundry look good. The 11 drying rods provide you with up to 25 feet of drying space. Then when you do not need it, you fold it down to a compact size for easy storing. Its under 5 pounds of weight means anyone can move this from storage to its drying spot and back with ease. 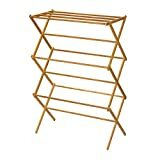 The angled feet provide the stability this 42 x 29 x 14” drying rack needs for your clothes. Made from bamboo, you know this drying rack will handle your laundry for years to come. Bamboo is one tough, strong and durable wood. When you want to save money, you go to manual folding clothes drying rack. They unfold and fold up nice and easily without using any energy. This steel drying rack has 11 drying rods and up to 20 feet of drying space. Its waterproof coating not only protects the rods and legs but resists rust and mildew as well. The design is tough enough to handle the rough outdoors as well as the safe indoors. Its overall dimensions, 22.44 x 14.57 x 41.34 inches, should fit into a standard bathtub if you do not have a basement or outside area to put this drying rack. Black plastic caps protect clothes from sharp edges and the covered feet reduce slipping. When you need a lot of drying space but do not have a lot of room, this drying rack fills the need. 3 tiers make sure you get roughly 20 drying feet of space. Plus, you have to swing arms that come out. These arms hold your clothes that need to be placed on hangers. Measuring 26 x 29 x 67 inches, the unit sits on castor wheels for easy transporting. You can roll this drying rack from room to room with ease. When you do not want it to move, you can lock the wheels in place. Its versatility is a big plus as well. When you do not need it to dry your laundry, you can use it as a moving closet. Easy to assemble and refold. Measuring 14.5 x 29.5 x 41.75″ you get up to 40 pounds of wet clothes on this drying rack. The 11 drying rods are strong and should last you a long time. Its white coating fights against rust, mildew, bad odor and more. When the laundry is done, just fold it up and put it away. Furthermore, it is so light even a child could do it and once you bring it home from the store, it is ready to go right out of the box. Moreover, no assembly is required. If you prefer to dry your clothes outside, this drying rack is designed to handle the outdoors and its weather conditions especially, made from steel you know that this drying rack is tough and will last you a long time. You may think that an electric dryer is better for your clothes but in the long run, it seems that there are more benefits to using one of the top 10 best folding clothes drying rack in 2019. Clothes last longer- using a dryer can cost your clothes needed fibers, for the reason this helps them wear out faster. Healthier clothes- the sun has natural disinfectants and whitening elements so, it protects your clothes from germs and bacteria. Hanging clothes keeps stress away- you get to slow down and relax a bit as you hang your laundry. Saves you money- a clothes drying rack is a lot cheaper than an electric dryer. Saves you money 2- when you stop using the electric dryer and start using a drying rack, you cut your power use down and this saves you money on your electric bill. Drying your clothes in an electric dryer is convenient and fast but the expense may not be worth that convenience, meanwhile using one of the top 10 best folding clothes drying racks in 2019 may be the better option. 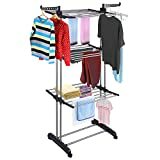 Not only save money but you can take the rack just about anywhere you go with ease because they fold up nice, small and fit in your car and also, these drying racks do hold a lot of wet clothes. Plus, the folding drying racks are easier on your clothes which you do not have to replace them as often and you also do not have to worry about your dryer eating a sock or two, as a result, all your socks pairs remain intact. With all the benefits a folding clothes drying rack brings so it may be a smart move to reconsider your laundry habits.